This post was sponsored by ZAQ, but all opinions expressed are my own. There are three main ways that you can add essential oils to your little one’s life. Though some do ingest oils, it is not safe for this age. Those three ways are: applying a with a carrier oil, applying “neat,” and diffusing in the child’s space. Below are simple guidelines are safe for children in these age brackets. Test every oil you give your child on a small location before using a new oil. Though an oil may be safe for one child, another child may react differently based on genetic, toxin, and nutrition level. With such a new immune system, you really want to interfere as little as possible. Before six months, do not use any essential oils in any manner. As your babe’s immune system is still building, you still do not want to directly apply oils. 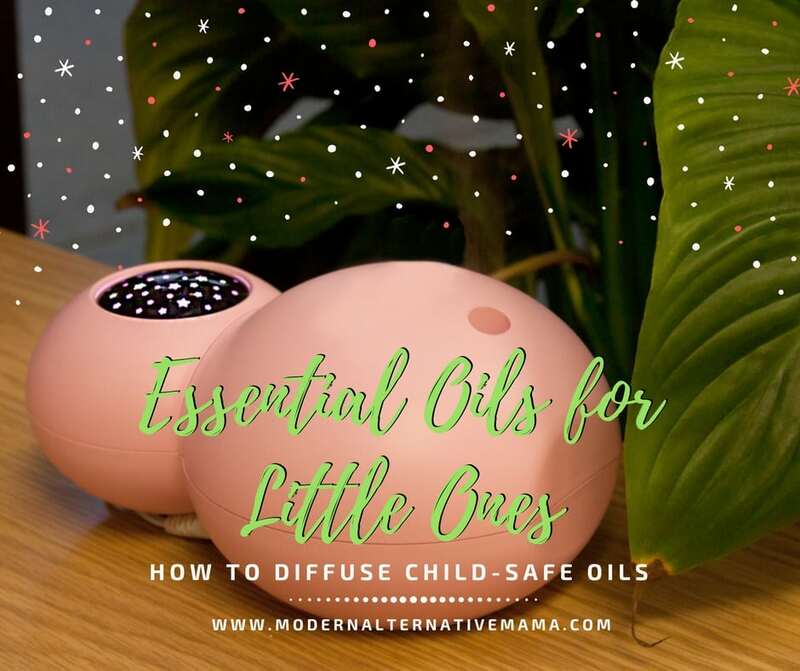 However, you can diffuse the oils (well-diluted) in the same room as your child. You will still want to only add 1-2 drops of oil to your diffuser. A wonderful, child-designed diffuser can be found below! At this age, you can start to apply oils topically when diluted. You will want to use at the very least 1 drop to 1 tablespoon of carrier oil (coconut oil, almond oil, avocado oil, castor oil). You will still want to be safe and only use the oils listed above until around four years of age. The immune system is typically built up by three to four years old. At this age, you can start diluting less and using virtually any essential oil. I would still always test each oil on a small area and be careful with less diluted concentrations. A few tablespoons of a carrier oil. Options include: coconut oil, almond oil, avocado oil, castor oil, or even olive or sunflower oil. A glass jar with a lid. You can purchase small mason jars, or even oil bottles at local health food stores. Pour your carrier oil into a small glass jar and add 2 drops of lavender essential oil. Keep near bed and apply to feet or chest (just a drop!) before bedtime. Mix your carrier oil in a small glass jar, and add the drops of your essential oil. Keep in your first aid kit for a go-to chemical free antibiotic ointment. Mix your carrier oil in a small glass jar, and add the drops of your essential oil. Keep near your educational area for when the little ones have a hard time focusing. Applying an essential oil without a carrier oil is called applying “neat.” Though this is safe for most adults, it’s strongly suggested that this is not used on children under ten to twelve years of age. A diffuser allows water and essential oils to be deposited inside, and slowly and lightly sprays it into the air. You only need one per room. I’ve found that diffusers may only come in a “mom” style. Chic and modern is great, but not really my kid’s style. Enter the Sky diffuser by ZAQ! This diffuser comes in five fun colors, a thirty-minute timer, and projects colorful stars onto the ceiling. It’s the perfect diffuser for a kid’s room! For a limited time, you can preorder this diffuser valued at $50 for $25! Check out the SKY diffuser in action! Pour the water and lavender oil into the diffuser, and start it right before bed! Pour the water and each drop of oil into the diffuser, and diffuse as your little one wakes up! It may be helpful to keep the child-safe oils in a special spot so you do not accidentally use an unsafe oil on a child. Essential oils can truly be one of the best weapons to fight infections naturally, but be sure to not use the wrong oils on young children. Have you used essential oils on your child? What did you diffuse? Great article! If I diffuse lavender at bedtime for my 3 and 5 year old. They are in the same room. How long do I run the diffuser? A couple hours? All night? Thank you!